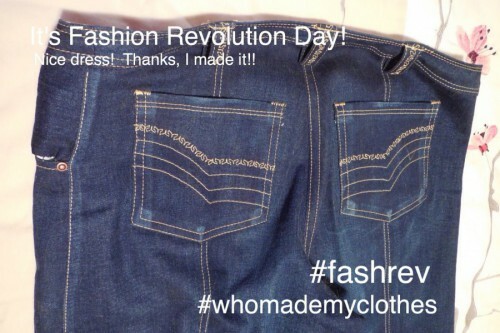 Fashion Revolution Day! – Nice dress! Thanks, I made it!! It’s April 24, 2015, two years ago today the Rana Plaza Factory collapsed in Bangladesh killing 1133 workers and injuring thousands more. Today is a reminder. How can you help? Check out their site! April 24, 2015 Linda of Nice dress! Thanks, I made it!! I didn’t want to “like” this post, but that doesn’t mean that I’m not extremely appreciative of your reminding me. This was a terrible, preventable tragedy. I hope the world is working to prevent another one. Yes, I agree! I am not an expert in world affairs, economics, etc. but what is obvious is people must not be exploited, they must be kept safe! Thanks for posting this. It’s great that we can all educate each other. Yes, sorry I don’t mean to preach… It’s just a story (Bangladesh) that stuck in my head! Thanks for the reminder! We need to remember this tragedy to prevent another one. Linda, thanks for the reminder. A (former) friend was on the board of directors for a clothing company. They moved their factory from Pakistan to Bangladesh because it was cheaper. Instead of paying workers 52 cents/ hour, they paid them 24 cents. Unbelievably exploitive. That’s a terribly sad story! Thanks for sharing.